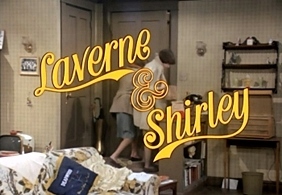 Laverne & Shirley was a spin-off of Happy Days, both were Garry Marshall productions. Set in the late 1950s in Milwaukee the two girls who are childhood friends, who share a basement apartment and work at the same brewery, as bottle cappers. 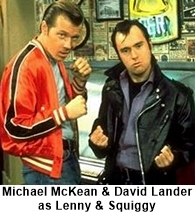 Also in the cast are Lenny (Michael McKean) and Squiggy (David L. Lander) who are upstairs neighbors of the girls. Frank De Fazio (Phil Foster) is Laverne’s father and owner of the Pizza Bowl which is a local hangout like Arnold’s in Happy Days but with bowling. Edna Babish (Betty Garrett) is the girls landlady and later marries Laverne’s dad becoming her step-mother. Carmine Ragusa (Eddie Mekka) is Shirley’s ex-boyfriend who still has an on again off again relationship with her. Both Betty Garrett and Eddie Mekka get the chance to showcase their singing and dancing talents in a few episodes. The series moves to California in the sixth season with the girls getting jobs at a department store as gift wrappers. In the eighth (final) season Cindy Williams departs the show and Penney Marshall continues the season without the Shirley character. Marshall is asked to do another solo season but she wanted the show moved to New York but ABC felt that move couldn’t be cost effective so the series wasn’t renewed for the 1983-’84 season. Cindy Williams became pregnant during the 1982-1983 season. She asked the studio for certain considerations (demands) during and after the pregnancy which they promptly refused. She was forced to leave the series for which she filed a 20 million dollar lawsuit. The suit was eventually settled out of court with Williams getting her fair share. Michael McKean and David L. Lander were originally hired as writers/consultants on the series. 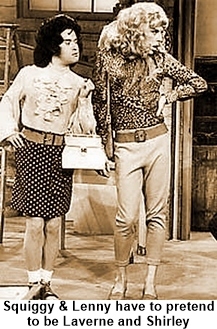 They convinced the studio to let them write themselves into the show as “Lenny” and “Squiggy”, who were based on two characters they had developed while in college.